While kind-of celebrity Rosie O’Donnell has perfected being generally terrible at comedy — I mean, she’s not even trying anymore — O’Donnell has decided to try her hand at a new venture: bribing politicians. 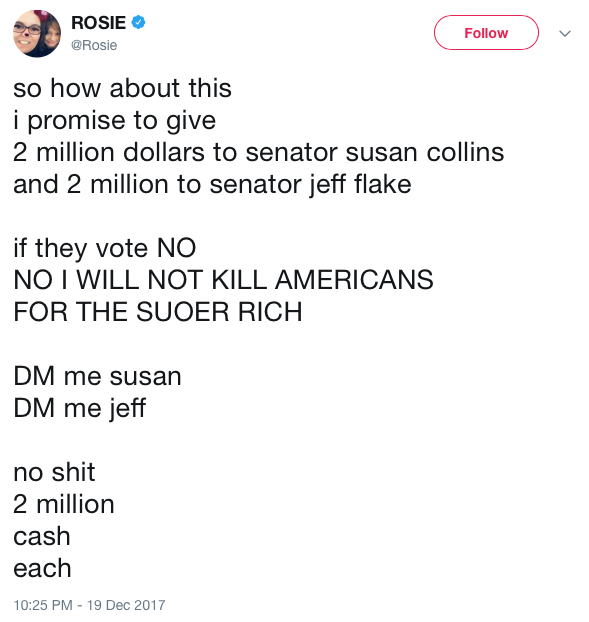 O’Donnell took to Twitter on Tuesday to offer $2 million cash to both Rep. Susan Collins (R-Maine) and Sen. Jeff Flake (R-Ariz.) in order for them to vote no on the current GOP tax bill that — as of this writing — was just approved by the House. The bill passed in the Senate early Wednesday morning. Listen, I know Rosie isn’t the brightest crayon in the box, but if she put her foot in her mouth any further you’d be able to see shoelaces in an x-ray of her stomach. Since O’Donnell is apparently serious about her offer to Collins and Flake, let’s give her a little preview of her future should anyone of any consequence take her seriously. […]shall be fined under this title or not more than three times the monetary equivalent of the thing of value, whichever is greater, or imprisoned for not more than fifteen years, or both, and may be disqualified from holding any office of honor, trust, or profit under the United States. Go ahead, Rosie. Give them the bribe. I just hope you have an extra $12 million to pay the fine. As for the prison sentence, if O’Donnell went to jail, I’m not sure very many people would miss her.